The following are some tips for selecting hearing aids for your child. Like computers and smart phones, technology is constantly changing. Newer technology can now remain “current and compatible” longer. A three-year-old child may not need a Bluetooth compatible hearing aid, but once that child is older, he/she may want to listen to videos, music or lectures at home or in a classroom. Be sure to think ahead when making your selection! Hearing aids (and FM systems - see #6) can be very expensive. Fortunately, there is financial assistance available to help children to get the hearing device they need despite the cost. A. Check your health insurance coverage. Ohio Medicaid and the Bureau for Children with Medical Handicaps provide coverage for hearing aids and there is typically no out of pocket expense for the family. Some private insurance plans also have Hearing aid coverage. The Ohio Hearing Aid Assistance Program (OHAAP) provides assistance to families with children, up to 21-years-old, with hearing loss, to purchase hearing aids, ear molds, assistive listening devices, external cochlear implant processor replacements, and/or hearing aid batteries. Families with incomes at or below 400-percent of the federal poverty guidelines are eligible for the program. A family’s eligibility can be determined using the federal poverty guideline table. Depending on income limits, families may be responsible to pay a sliding scale fee up to $20. The Cincinnati Children’s Hearing Aid Program (CCHAT) & Early Hearing Intervention program strives to provide Ohio children, from birth to age 3 their first hearing aids at no charge to the family. The Cleveland Hearing & Speech Center’s Audiology Patient Assistance Program program helps children (and adults) with limited financial resources get hearing aids, assistive devices or hearing aid repairs. Patients are responsible for a co-pay which is determined based on income. • To direct and hold the sound into the ear with the right acoustic characteristics. • To anchor the hearing aid to the ear. A hearing aid must fit snugly to effectively hold the sound in without it escaping and causing feedback/whistling. Infants and toddlers ears grow very quickly and will outgrow their ear molds similar to clothing sizes. Young children move from size to size every few months and the same is true of their ear growth. As children age, the growth slows (they may be in the same “size” for a year or more). Generally, when children enter puberty, the outer ear is done growing. Children’s ear molds are typically fabricated in a soft material so the physical fit can better accommodate growth better and cannot crack or shatter. Ear molds are relatively inexpensive and can be replaced as needed without incurring the expense of a new hearing aid. Hearing aids come in many different colors. 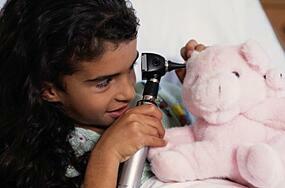 The audiologist will recommend the style that is best suited to your child’s hearing, but the color options are vast! If you, or your child, later change your mind, no worries! Hearing aid manufacturers can re-case a behind-the-ear hearing aid to a different color while it’s still under warranty – usually three years – at a nominal cost or no charge. So, if your five-year-old picks out a bright pink case but later wants a blue one, we can handle it! Ear molds come in a huge assortment of color choices. They can be multi-colored with different color flecks/swirls, camouflage, embedded glitter, and even glow in the dark (keep in mind: bright colors are also easier to spot if dropped in the grass). Anything that makes the hearing aids and ear molds the most kid-friendly and desirable, the better – and by the way, audiologists love copies of school pictures! In addition to hearing aids, there are other accessories and devices that work in tandem with hearing aids. Your child can have the option to stream music from their smart phone, talk with their gaming console and listen to their favorite podcast – all through their hearing aids! In some situations, hearing aids are not enough. Typically, those are situations are when background noise and distance are an issue. Hearing aids are most effective within 12- to 15-feet of the person speaking and work best in quiet environments. Background noise can make it difficult for anyone to hear, but can be especially challenging for a child with hearing loss. For example: When you get on the expressway, you may need to turn up the radio volume to better hear your music due to the increased noise floor at higher speeds. For children, classrooms can be like driving on the freeway, particularly in elementary school. The teacher is often more than 12-feet away from the student, which means the hearing aids, alone, aren’t going to give adequate benefit. Most young children with hearing loss routinely use FM technology in educational settings. The classroom teacher wears a transmitting microphone and his/her voice is sent directly to receivers that are connected to the child’s hearing aids. FM systems help with background noise and distance by improving the signal (what you want to hear) versus the noise (what you don’t want to hear) ratio. Although you are responsible for obtaining hearing aids, school districts typically supply, and pay for, FM systems used in schools. Parents can also purchase FM systems used at home for situations when hearing at a distance or in noise is an issue. There will be a lot of information and things to keep track of on this journey. It will help if you keep a folder (actual or electronic) of all of your child’s hearing evaluations, doctor’s notes and hearing aid records. This will especially be useful when one professional needs access to another professional’s record – you can easily share it. If your child is of school age, make sure your clinical/dispensing audiologist shares information with the educational audiologist.